After Breakfast Excursion to Kufri. In-route green valley covered with Deodar trees, charbra (wildflower hall), Kufri is famous for its Himalayan National Park, Pony and Yak Ride and One can see the endless Himalayan Panorama, after lunch sight seeing of Chail, Chail is a hill station visited by many tourists. The Deodar and Oak forests with grasslands around the township are the abode of wildlife, palace hotel of Maharaja Patiala, cricket ground, heritage Gurudwara sahib. B/H. After Breakfast Excursion to Mashobra, Naldehra and Tatapani, Mashobra is a beautiful village that lies on the road leading from Shimla to Naldehra, The entire valley is covered by dense woods of oaks and pines. One of the greatest places to visit at Mashobra is the Goddess Durga temple. 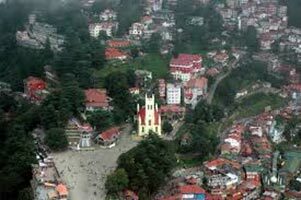 Mashobra attracts tourists for its utmost tranquility. The well known Craignano, fruit research institute, Naldehra is the site of the the oldest golf course in India. The beautiful golf course at Naldehra was the brainchild of none other than Lord Curzon-a viceroy of the erstwhile British Raj. Naldehra got its name from a Nag temple situated inside the golf course. Tall Deodar trees surround the links making it one of the most beautiful golf courses in the world. Tatapani is a well known place in the vicinity of Shimla. This particular place is known for its hot water springs. Tatapani is an ideal locale for enjoyment and recreation. The springs are found on the banks of river Sutlej and river rafting is the main attraction of this tourist place.and by the evening B/H. Shimla local city sight seen , first place start with the blessing of Lord Hanuman temple Jakhu temple, the highest peak of Shimla city, Vice Regal Lodge Heritage place and apart from the majestic building, it has well maintained lawns, Annadale the most picturesque place ,bottom of the city, Mall Road in Shimla, is a place which cannot be left untouched by any visitor. 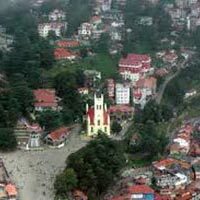 The lifeline of Shimla, Mall road, is the main tourist attraction in the town. The Ridge : This large open space in the heart of town presents excellent views of the mountain ranges.and by the evening B/H.